INDIANAPOLIS (Wednesday, March 26, 2014) – INDYCAR announced today that longtime development and race engineer Tino Belli will join the sanctioning body’s technical group as Director of Aerodynamic Development in early April. Belli, whose motorsports roots date to 1984 as chief aerodynamicist at March Engineering, will oversee implementation of the distinct aerodynamic bodywork kits supplied by Chevrolet and Honda for the 2015 Verizon IndyCar Series season. He also will provide INDYCAR data collection to determine track-specific configurations; provide direction and requirements for future regulations; support on-track, wind tunnel and straight line testing; and support the technical inspection process. As part of its long-range focus on innovation, INDYCAR announced last June that aero kits would be introduced in 2015 and include separate specifications for superspeedways and road/street courses and short ovals. Beginning with 2016, additional engine manufacturers and/or third party vendors will be eligible to be an INDYCAR-approved supplier. Correspondingly, Chevrolet and Honda will be able to upgrade their aero kits, which will be approved through homologation. During his 14 years with Andretti Autosport (1999-2013) as race engineer, senior development engineer and technical director, the team earned four Verizon IndyCar Series championships and 56 victories, including two in the Indianapolis 500. Previously, he was managing director of design, development and race engineering at Cyber Dynamics and also chief designer at Larousse F1. “We’re fortunate to have Tino come on board at the advent of aero kits,” said Derrick Walker, President of Competition and Operations, INDYCAR. “Apart from being one of Indy car’s most experienced aero engineers, he comes from the team environment with a lot of current experience and knowledge, which is important. Aero kits will improve the diversity of the fan experience and renew technical engagement, while providing a controlled cost structure,” Walker added. The bodywork components mated to the Dallara rolling chassis will provide INDYCAR a platform for performance and efficiency developments. The forward-thinking program is rData and Photo courtesy of IndyCarelevant to short- and long-term design and development objectives of the global automotive industry and aligns with research and development in multiple technology sectors. Additionally, an entrant’s aero kits will be aligned with its manufacturer, with the car incorporating the name given by the supplier. The 2014 Verizon IndyCar Series season opens w/the Firestone Grand Prix of St. Petersburg – March 28-30. So … you think you want to drive an open-wheel racecar ? INDIANAPOLIS (March 14, 2014) – INDYCAR announced today a multi-year entitlement agreement with Verizon that will see North America’s premier open-wheel racing championship named the Verizon IndyCar Series. The partnership aligns INDYCAR – the fastest, most versatile motorsports series with a heritage of innovation – with Verizon, whose technical expertise will be utilized to activate programs that will benefit fans, the series, teams, commercial partners and race venues. 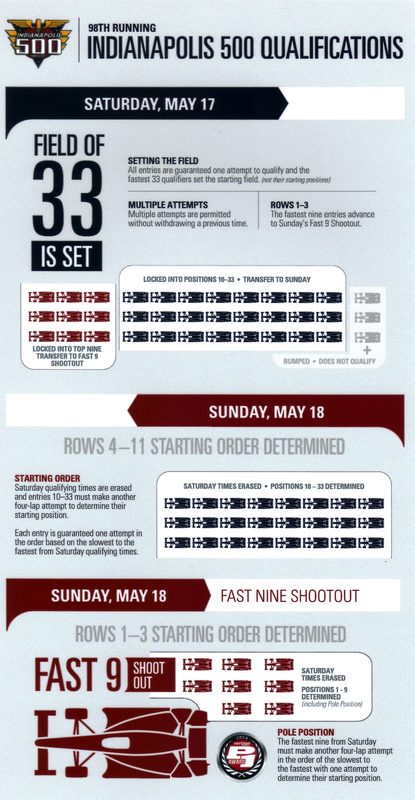 The schedule features a total of 18 races: 12 on road and street courses, including three sets of doubleheaders, with standing and rolling starts; and six races on a variety of short ovals and superspeedways, highlighted by the 98th Running of the Indianapolis 500 Mile Race. The “Greatest Spectacle in Racing” will be held on May 25 (12 pm ET, ABC) on the Indianapolis Motor Speedway’s historic 2.5-mile oval. In each of the past eight consecutive seasons the Verizon IndyCar Series championship hasn’t been decided until the season finale. The 2014 Verizon IndyCar Series season concludes with the MAVTV 500 on the two-mile Auto Club Speedway oval Aug. 30 (9 p.m. ET, NBCSN). Data and Graphics provided by IndyCar. INDIANAPOLIS (Friday, March 7, 2014) – INDYCAR announced a new qualifying format to set the 33-car starting lineup for the 98th Running of the Indianapolis 500 Mile Race. o The fastest 33 cars compose the starting field (but not starting positions). o All entries are guaranteed at least one four-lap attempt to qualify. o The fastest nine entries advance to the Fast Nine Shootout. o Saturday times are erased and entries 10-33 must complete another four-lap attempt to determine their starting position in order of the slowest to fastest from Saturday times. o Each entry will receive one four-lap attempt in the order of the slowest to the fastest from Saturday times. Aggregate times will determine the Verizon P1 Award winner and top three rows. Qualifying results on Saturday and Sunday will include new points incentives to be announced at a later date. Practice sessions before time trials commence are scheduled both days. Fans at home will be able to track their favorite drivers’ progress as they attempt to qualify for “The Greatest Spectacle in Racing” with extensive coverage on ABC. The network will televise qualifications live from 4-6 p.m. (ET) Saturday, May 17, and 1-3 p.m. (ET) Sunday, May 18, in addition to the 200-lap race Sunday, May 25, marking its 50th consecutive year of coverage of the race. Additional hours of qualifying will be carried on ESPN3, ESPN’s multi-screen live sports network, with the full schedule to be announced at a later date. “Down through history, qualifying for the Indianapolis 500 has made for many dramatic and compelling television moments, and we’re confident that the leadership of Indianapolis Motor Speedway and INDYCAR will continue that tradition with this new format. We look forward to bringing it all to our viewers in May,” said Rich Feinberg, ESPN vice president, motorsports, production. Beginning today through April 15, fans may purchase a qualifying ticket package for Saturday and Sunday for $30 (single day tickets are $20). The Fast Nine Shootout was introduced in 2010 as part of time trials. Ed Carpenter claimed the pole last May with a four-lap average speed of 228.762 mph, becoming the first team owner/driver since 1975 to earn the coveted No. 1 starting position. Eighteen drivers have won the historic race from the pole position – most recently Helio Castroneves in 2009. Rick Mears, who earned the pole six times at Indianapolis, won three of his four races from the top starting position. Team Penske’s Castroneves, a four-time Indy 500 pole sitter, seeks to join Mears, A.J. Foyt and Al Unser as the only four-time winners of the race. Tony Kanaan, who won the 97th Indianapolis 500 after starting 12th, will drive the No. 10 Target Chip Ganassi Racing car in an attempt to successfully defend his title. Kanaan’s new teammate, reigning IndyCar Series champion Scott Dixon, will seek to win his second 500 Mile Race. He won from the pole in 2008. Mears (1979, 1981) and Johnny Rutherford (1980) combined for the lone three-year stretches in which the pole sitter won the race.